KingSong KS-16S offers tremendous performance. The maximum speed is 35 km/h, and the maximum range is 70 km. Now, KS16S is also available in unique Black Matte colour. The casing has been finished with rubber. Also, the side pads are fully Black - without the KingSong logo. The new KS16-S is equipped with the newest pedals, designed by KingSong to guarantee the best shoe traction possible. Besides, this sport line has additional markings on the big, comfortable side pads. The best telescopic handle on the market. KS16 inside buildings is much more comfortable than a suitcase on wheels. KingSong didn't forget multimedia features in the sport version. KS16S has the richest equipment out of the box. Its two stereo speakers give a clear and deep sound for your favourite music, played via Bluetooth. Manage your KS16 on your Android, BlackBerry or iOS. Each update adds new functions to your KS16-S! To meet the KS-16S needs, KingSong created a new electric engine with 1200 W rated power and even 3000 W maximum power output. Additional 840 Wh batteries - from LG or Sanyo (Panasonic subsidiary) - makes KS16-S the unquestionable leader in its class. 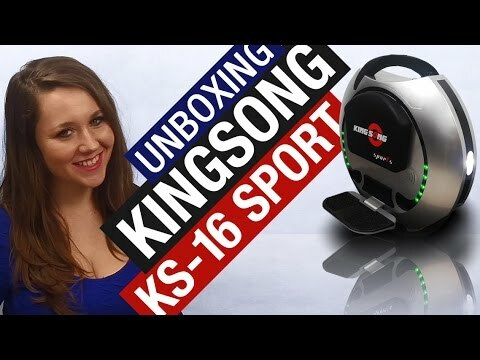 Click on the thumbnail and watch the KS-16S unboxing, featuring Justina! Justina has created a short video-presentation. Click on the thumbnail, to play the video.